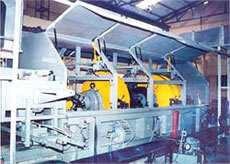 Dynamometer for testing Railway Brake Blocks and other Heavy Vehicles Brake Linings, installed at our Paithan Plant. Quality, Product Range, Field Services, Distribution Network, National and International Product specification compliance, Technical support, Research & Development make Hindustan Composites Limited, the name to choose for Friction Materials and Fluid Sealing Products. The Research and Development Department is recognised by Department of Scientific and Industrial Research (DSIR) Govt. of India, since last 20 years. HCL has demonstrated throughout its history that there is no Friction and Sealing application, no challenge that it can not meet - anywhere in the world. HCL has the experience, the technology and innovative spirit that have guaranteed HCL's continued success in the development of Custom Engineered product to meet specific customer application requirement. The Quality Control and continuous quality improvement program had enabled HCL to have accrediation by Det Norske Veritas for ISO / TS 16949 : 2009 Quality System. Quality Control Department has all the necessary instruments and testing methods for Friction materials, so that tests can be carried out as per IS, BIS, BS, ASTM, DIN & JIS Standards.